Prof. (Dr.) Faizan Mustafa is the current Vice-Chancellor of National Academy of Legal Studies and Research, (NALSAR) Hyderabad. 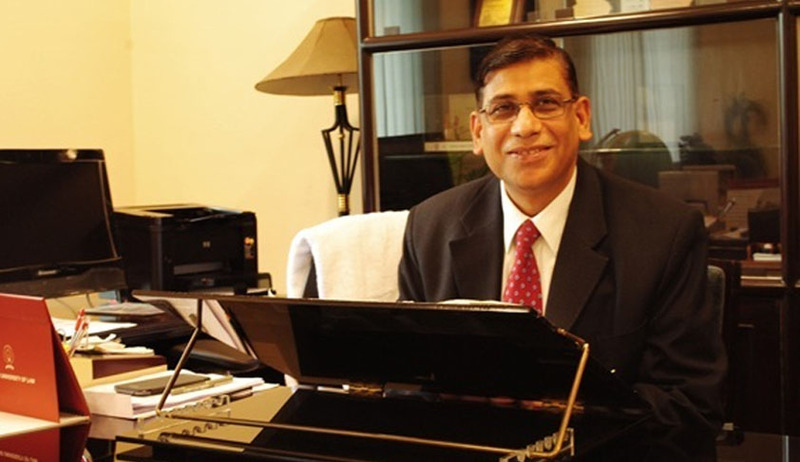 Before joining NALSAR in 2012, he was the founding Vice-Chancellor of National Law University Odisha, (NLUO) Cuttack. Prof. (Dr.) Faizan Mustafa completed his LL.M. from Aligarh Muslim University, (AMU) Aligarh. He, being a gold medallist, was persuaded to join the AMU Law Faculty. The academic journey was followed by the administrative one and he worked as Dean, Faculty of Law, Aligarh Muslim University and then served as AMU's Registrar. His contribution in drafting the Eritrean Constitution, teaching High Court Judges and working directly under the Prime Minister of Ethiopia, is well known to the legal fraternity. Thereafter, he was appointed as the Founding Director of KIIT Law School, (KLS) Bhubaneswar and subsequently he went ahead and established National Law University Odisha, (NLUO) Cuttack in 2008 which became functional from 2009. Prof. (Dr.) Faizan Mustafa has also authored several books and number of International as well as National Publications. He also writes regularly on contemporary legal issues in National Newspapers. He is the only academician who has been nominated as member of National Legal Services Authority, which is headed by the Chief Justice of India. He is a member of Executive Councils, Academic Councils and General Councils of various universities and has been on various committees responsible for identifying new Vice Chancellors. He enjoys teaching a lot and is a great orator. His achievements are many and he is an eminent academician, a passionate teacher and a commendable scholar. Live Law: Hello Sir, First of all heartiest congratulations on receiving the prestigious SAARC's Best Law Teacher Award. Sir, How do you take this award, as an acknowledgement of your efforts or as a burden/pressure to perform well in future also? Prof. (Dr.) Faizan Mustafa: Teachers don’t teach with the intent to receive awards. Their best award is the success of their students. Still this award means a lot to me as I am the first in-service Indian Law teacher to receive this award and therefore the burden to perform well in future necessarily comes with this award. I am grateful to the jury and Prof.N.R.Madhava Menon and Mr.Lalit Bashin, President of Indian Law firms for conferring this award on me. I have little doubt in my mind that I hardly deserve this honour, but I can tell you that teaching is my passion and the kind of interest which my students have shown in my classes are my best reward. Live Law: Please throw some light on the struggle in your life. Prof. (Dr.) Faizan Mustafa: By the grace of Almighty so far I had a smooth sailing and have not experienced any real struggle. I was offered Assistant Professorship on the 25th day of my completing LLM. In fact I was never appointed as permanent Assistant Professor and was directly made Associate Professor after serving as temporary Assistant Professor for 5 years. I got all my promotions on time. I had a huge challenge of setting up KIIT Law School and to make it comparable with National Law Schools but with the help of Dr. Achuta Samanta the visionary founder of KIIT University within no time we were able to compete with the leading Law Schools of the country. KIIT Law School has a name of its own today and is the Champion of Bar Council of India Moot Court. My students from KIIT Law School are doing well. Yesterday, I read an article published by two of my students- Mr. Kanad Bagchi & Jeet Soni- in the prestigious Economic and Political weekly. KIIT Law School students were responsible for the inclusion of third gender in the voter list. The issue was raised when Mr. Navin Chawla then C.E.C. visited KIIT Law School. My next challenge was establishing National Law University at Cuttack. For 3 years I worked for 16-18 hours and today I am glad to see that NLUO is also coming of age and my students are doing extremely well not only in Moot Courts but also in the publications of research papers. NLUO has unique curricula and has integration of knowledge as its motto. NALSAR offered me a different kind of struggle. I had taken over at a very difficult time when there was too much negativity about NALSAR. I am glad that today NALSAR is the most happening place with huge positivity and the kind of experiments which we are making at NALSAR are unheard off in the National Law Schools. I hope in years to come we will reap rich harvest out of these experiments. Live Law: Sir, whether National Law Universities are serving the same purpose as sought by Prof. Madhav Menon? Prof. (Dr.) Faizan Mustafa: National Law Universities have done a great service to legal education. If today law is a prized course it is because of National Law Universities. Today B.A.LL.B.from NALSAR is as prestigious as MBBS from CMS Vellore or B.Tech from any leading IIT or MBA from IIM (Ahmedabad). Corporate lawyering is also lawyering and our students have indeed done very well in corporate law firms. Payment of education loan compels my students to join Corporates. There is a recent trend of our students returning to litigation after serving corporate law firms for few years. It is a welcome change and I am sure the litigation lawyering will also be soon dominated by students of National Law Universities. Senior lawyers should pay good salaries to attract young law graduates. Live Law: It has been said that National Law Schools are way better than Traditional Universities but in fact most of the Vice Chancellors and Faculty of National Law Schools are from traditional Universities. Then, how can you justify that National Law Schools are academically stronger than Traditional Universities? Also there is dearth of faculty for teaching core subjects in National Law Universities, how do you think this affects the argument that they are better than Traditional Universities? Prof. (Dr.) Faizan Mustafa: It is true that all the Vice-Chancellors of National Law Schools had their education in the traditional universities. Aligarh Law Faculty has given the maximum number of Vice-Chancellors to National Law Universities (Prof. N.R. Madhava Menon was Vice-Chancellor of National Law School of India University, Bangalore and W.B. National University of Juridical Studies, Kolkata, Prof. V.S. Rekhi was Vice-Chancellor of National Law Institute University, Bhopal, Prof. A.K. Kaul was Vice-Chancellor of National Law University Jodhpur &National University of Study & Research in Law (NUSRL), Ranchi; Prof. Leela Krishnan of The National University of Advanced Legal Studies, (NUALS), Kochi) but then National Law Universities can’t be blamed for not producing Vice-Chancellors as they are new institutions. National Law School of India University, Bangalore is in its Silver Jubilee Year and NALSAR in its 15th year. Other law schools are still younger and therefore to expect their students to occupy the senior position of Vice-Chancellor is unrealistic. As far as faculty members are concerned now many students of National Law Schools are teaching in various National Law Universities and I am sure in years to come this number will only grow. I have succeeded in pursuing some of our graduates to join NALSAR. I am of the firm view that in the recruitment of Assistant Professor, B.A.LL.B. should be made qualification instead of LL.M. with NET and LL.M. should be done only in service. I have already written a long letter on this subject to Bar Council of India. In my opinion National Law Universities are academically stronger than traditional universities because they are full-fledged universities of law. Law department in a traditional university will be only one out of 100 departments with very little autonomy to design its courses. In terms of resources also they have issues. In National Law Universities we have full autonomy as we have our own Academic Council & Executive Council. National Law Schools also have the involvement of Judges and lawyers of Supreme Court and High Court for a better Bench-Bar-Academia relationship. The teachers of National Law School are far more focused in their researches than the teachers of the traditional universities. It is a different story that several National Law Universities have not made full and good use of their autonomy. I always believe that readymade teachers are not available anywhere. It is the duty of the Vice-Chancellor to locate the raw talent and then with the help of senior Professors train these newly recruited youngsters. Live Law: Sir, as a sitting Vice-Chancellor of a National Law University, what are your comments on ‘Online CLAT’ Examination which is going to start from 2015. Prof. (Dr.) Faizan Mustafa: Personally I have reservations about the Online CLAT Examination but then it is the decision of the CLAT Core Committee and I am bound by its decision. Live Law: All India Bar Examination is a mandatory exam to be given by a law graduate in order to enrol his/her self to the practise of the law. The exam pattern is Multiple Choice Questions (MCQs) and it is an Open Book Exam. Sir, what purpose does an ‘Open Book Method’ serves? Your comments on such pattern of exam. Prof. (Dr.) Faizan Mustafa: Open Book Examination is a good and modern method but then questions should not be based on facts or provisions. They should require testing of analytical skills not memory. Most paper setters do not know how to set questions for an open book exam. Giving of Bare Acts in Law examination is not something very new. In several judicial service examinations, Bare Acts used to be supplied as candidates were not expected to memorize the language of legal provisions. Even in multiple choice questions the smart paper setter may test analytical and logical understanding. Live Law: Sir, you have always promoted legal education and legal profession. The recent regulation by BCI restricts young law advocates from practising in Supreme Court. Do you think that such restriction by BCI is justified? And if yes then on what grounds is it justified? Prof. (Dr.) Faizan Mustafa: I am not in favour of restricting young law graduates in practicing in the Supreme Court. India is a country of young people. They are our best human resource and we should make best use of them. These young graduates can quickly learn from senior advocates. Live Law: Sir, you have been a Student, a teacher, a dean, a registrar and also Vice-Chancellor. Was the trajectory of your career a result of careful planning or was it a matter of destiny? And what next have you planned, sir? Prof. (Dr.) Faizan Mustafa: My career trajectory was not planned. I never dreamt of being a Vice-Chancellor. I am convinced I don’t deserve it as better people are around but since destiny has put me in this place I must deliver to the best of my abilities. I enjoy teaching and I am passionate about it. Thus I plan to go back to teaching. In my view one should stay at a place only when one is meaningfully contributing to the institution. Thus if I think I cannot do anything anymore or not allowed to do things at my pace, I prefer to move out. A player who has got tired should go out of field so that an energetic substitute takes the field and makes greater contribution to the team/institution. Live Law: As someone who has worked on projects abroad, do you have advice to students who want to work in the international field? Prof. (Dr.) Faizan Mustafa: I think a foreign degree gives us a unique experience and those who have opportunity to go abroad must avail this opportunity. Number of my students are in international law firms and they are doing exceedingly well. Live Law: How will you describe your Working day at NALSAR? Do you have any changes planned in the University? Prof. (Dr.) Faizan Mustafa: I have enjoyed my stay at NALSAR and the credit for this goes to my faculty members and students. We have already brought number of changes at NALSAR such as introduction of choice-based credit system, innovative/project scheme & less stressful introduction of large number of optional and huge reduction in mandatory courses. I think NLU Curricula is too stressful and we must take some radical steps to reduce academic stress. Similarly I have given NALSAR Rules & Regulations. We have drafted Financial Regulations, Purchase Rules, Service Regulations, laid down Recruitment Policies, for the first time drafted Academic Misconduct Policy etc. For the first time file note sheet system was introduced. We have brought in openness and transparency in our decision making. Live Law: what are your thoughts on a Student Exchange Programme between National Law Universities? Prof. (Dr.) Faizan Mustafa: I am for student exchange between National Law Universities. I think it is a part of social responsibility of leading Law Schools to help new National Law Schools and traditional schools located in their states. Just becoming an Island of excellence in themselves is not a great achievement. We should extend our helping hand to other traditional law colleges as we owe some duty towards them. Live Law: Sir being an alumnus of AMU, I am sure you must have heard about the recent stories about female students not having access to the Library. Do you have any comments about it? Prof. (Dr.) Faizan Mustafa: The Media coverage of library was not fair as media failed to understand the dynamics of the problem. Maulana Azad Library of AMU already has more than 3,000 female members. All post-graduate girls, female research scholars and girl students of professional courses including B.A.LL.B. and other courses such as B.Com, B.Lib.etc. are already members of this library. For the students of the Women’s College, there is a library within the premises of the Women’s college and the catalogue of Maulana Azad Library is also available to the under-graduate students of Women’s college. Whatever books they want from main library they make an online request and get it in two hours’ time and therefore a mountain was made out of a molehill. In any case the Allahabad High Court has permitted even the under-graduate girls to visit Maulana Azad Library and the university has implemented the decision of the High Court. Nobody ever raised similar questions about Delhi University where under-graduate girls are not allowed in the main library. Live Law: Sir, Your message to your students across the Country. Prof. (Dr.) Faizan Mustafa: My message to students is there is no shortcut to success. Hard work alone pays. Do not run after short term gains. This is the best time to study law. Thank you so much sir for your valuable comments and time. We wish you all the best .